The inn, vineyards, & seasonal terrace are nestled in our secluded valley in rural Rock Island County, and the winery & tasting room rest on historic U.S. Highway 67 in Mercer County, just 9 miles from the inn. 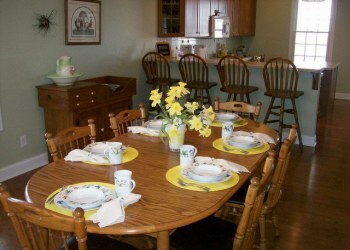 Both locations are minutes away from the downtown areas of the Quad Cities, Moline International Airport, Jumer's Casino, the I-Wireless Center, & other area attractions. Whether it�s the expansive vineyard view, comfy king-sized beds, or mouthwatering breakfasts, we offer an escape like no other. Plan a retreat with friends, a secluded getaway, celebrate your wedding, anniversary, birthday, or just enjoy a �staycation� close to home. 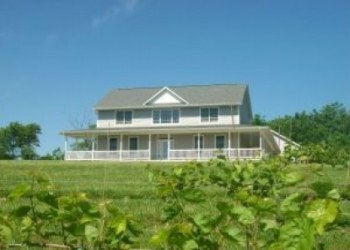 The folks at Creekside love spending time in the vineyard. There is just something to be said about waking up in the early morning and walking the vines, tucking shoots, and harvesting. From planning, to pruning, to training, to harvesting, they oversee all seasons in the vineyard, and for those who have tended vines, you know that being a vineyard owner is truly a labor of love. For those interested in the specifics of viticulture, Creekside has trained our vines using a Vertical Shoot Positioning (VSP) trellis system, a method that allows the vines to achieve optimum harvest parameters and, thus, high quality grapes for winemaking. The vineyards were first planted in 2007. Their 2,200+ vines consist of five grape varietals: Marquette, LaCrosse, La Crescent, Mars, and Reliance. 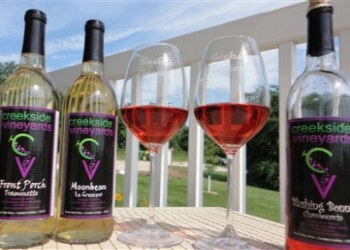 The first three varietals produce wines for Creekside Vineyards Winery; the latter two are table grapes to be enjoyed seasonally by guests, friends, and family. Country Road (Chambourcin) Dry: our non-oaked, �big n bold� with a velvety finish. Rock Island Red (Frontenac): Dry, yet fruity, light-bodied, lively & delicious. It makes a great sangria or compliment to pizza! Serve chilled or at room temp.